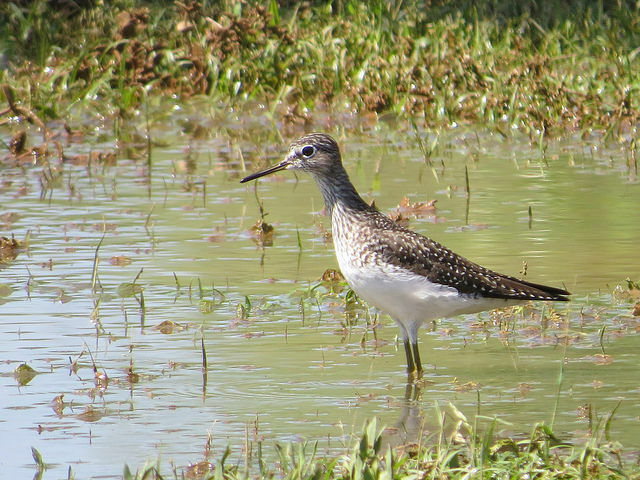 The hot, dry conditions that have made for good shorebird habitat at area ponds has also produced attractive conditions for waders. The pond at Ezzell Farm recently hosted nine great egrets, a great blue heron, and one green heron. 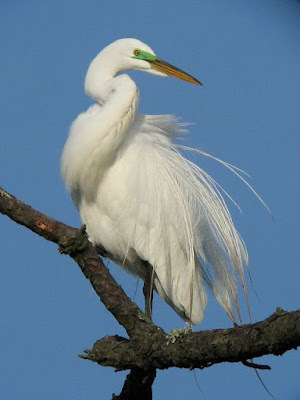 I watched the nine egrets fly in late one afternoon and land in the tops of adjacent pine trees. It was a nice spectacle, and one not seen commonly in this area. These three species are the most expected waders to be encountered her but good conditions often result in some rarer species dropping in. I took a late afternoon walk down to an old cow pond at Ezzell Farm in Mint Hill yesterday. My hunch was that hot, dry conditions had significantly shrunk the amount of water, exposing lots of exposed mud around the edges. I was right. 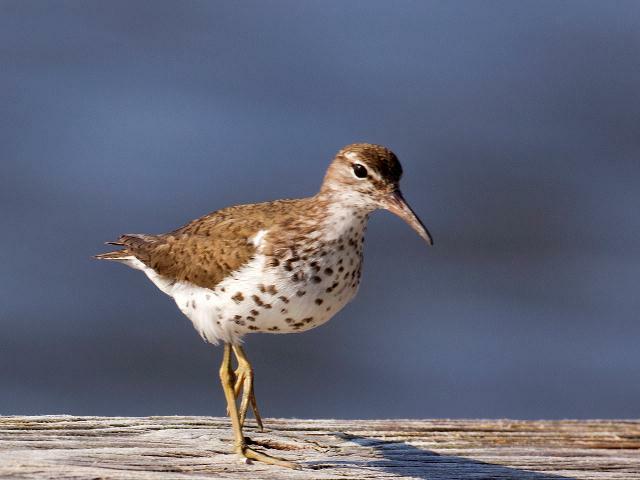 As a result, I was able to tally my first migrating shorebirds of the fall migration season. One solitary sandpiper and one spotted sandpiper foraged along the edges. Both species are among the most common shorebirds that pass thru our area but their presence indicates that the pond is attractive to shorebirds right now and could attract something a bit more interesting if conditions persist. I’ll be checking this pond regularly for the next couple of months. 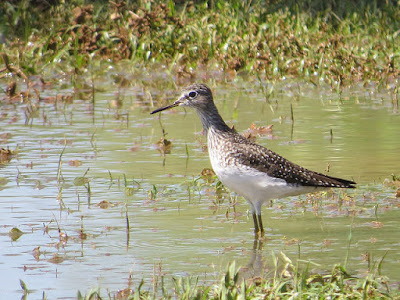 I checked several wetlands and ponds last weekend for any unusual waders that might have wandered into our area. I didn’t find any but at every stop I found green herons. They seem to become more conspicuous in mid-summer as water levels fall and the number of frogs increases. 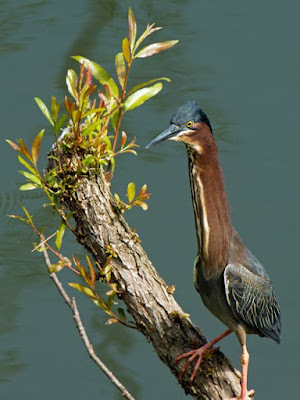 I was also reminded that the green heron is the ABA’s (American Birding Association’s) Bird of the Year for 2015. The green heron is a common resident in the piedmont during the nesting season. I most often see them sitting motionless on the edges of ponds or on downed logs or stumps. They prefer the motionless approach to hunting; waiting for a fish, frog, or other appropriate prey to wander near. Sometimes you have to really scan the water’s edge to see them, they are only about the size of a crow after all. That’s about two and a half times less than the size of the familiar great blue heron that is also common here. Green herons are also unique in that they actually use bait to catch prey. An enterprising bird will use a feather, leaf, or some other floating object to attract small fish. The heron will drop the object onto the water’s surface and wait for an unwary fish to check out the disturbance. If unsuccessful the heron will simply retrieve the lure and cast again. I see green herons along Four-Mile Creek Greenway. Watch for a small dark heron that might flush from the stream bank. But you may have to look closer than that; a few years ago a young bird allowed greenway walkers and joggers to approach to within just a couple of feet or so while it watched the water intently for a potential snack. I think that is part of the widespread appeal of the green heron, a quiet non-menacing fearlessness that many individuals exhibit. 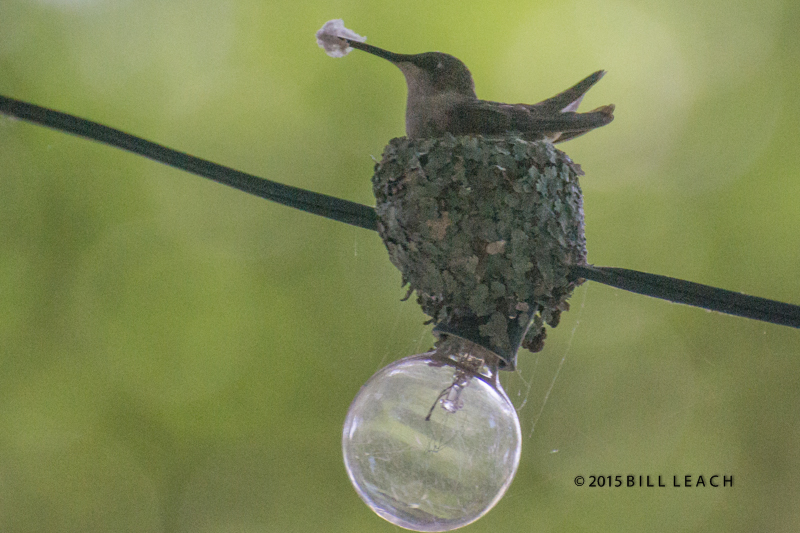 I received these photos just a few days ago of ruby-throated hummingbird nests in unusual locations. I never cease to be amazed with how birds choose their nest sites. 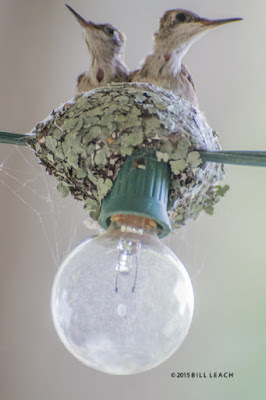 This bird constructed two nests on a string of lights under a front porch roof. The top photo is of the female putting the finishing touches on one of her nests. Apparently two nests were present and were simultaneously active. Again, this bird below opted to build a nest at a front porch, this time on a hanging wind chime. Clearly the birds know a safe location when they see it. Obviously the nestings were successful as evidenced by the presence of nearly fully grown juveniles in both. The combination of a sheltered site, stable substrate to attach the nest to, inaccessibility to the nest from below (unlike a tree) and maybe the close proximity of humans all combined for a great nest site choice for both birds. Bees at the Hummingbird Feeder? Here are some Tips. I have been getting a few questions about getting rid of bees that are over-running hummingbird feeders. This can be a big problem this time of year but fortunately there are some easy fixes. Examine your feeder closely for leakage. 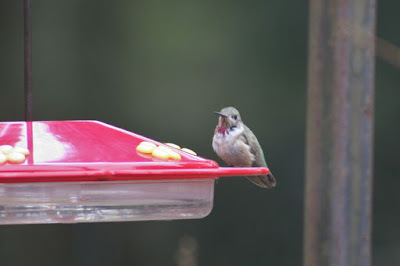 Jar-type feeders can loosen up in very hot weather and the expanding nectar inside can be pushed out. Switching to a bowl-type feeder can correct this problem. And just make sure all the connections on any feeder are tight. While red attracts hummingbirds, yellow is very attractive to bees. Simply removing any yellow parts of the feeder can really cut down on the intruders. Also, try moving the feeder just a few yards away from the current location. Bees won’t be able to find it for a while. You can also give in to the bees in a way. Provide them their own nectar in an open bowl or pan. Move it further and further away each day until ample separation from the bird feeder is achieved. In the photo below, the bowl-type design may be better to control leaks. also note the yellow flower shapes at the feeding ports. 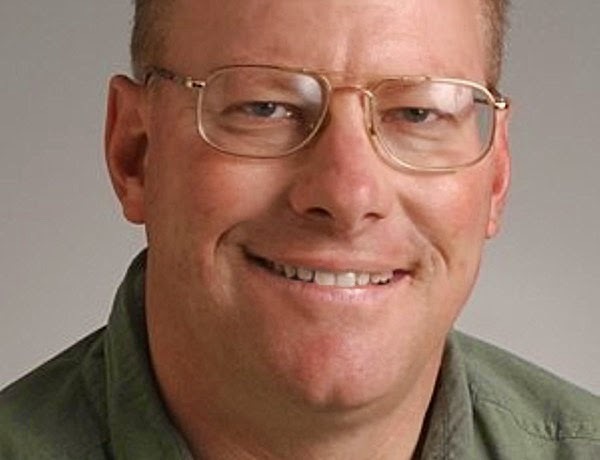 Simply removing them can solve a bee problem.